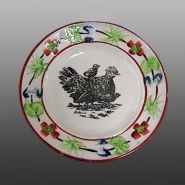 A similar, but smaller, child's plate printed in black with a hen and chicks pattern. It is 4.5 inches in diameter. An earthenware child's plate printed in black with a turkey pattern. The molded floral border is painted overglaze and the rim is enameled in brown. It is possibly part of a series. Another example with a hen and chicks is shown below.